A Butler's Manor Bed and Breakfast is a resplendent guest house in Southampton that offers silver service hospitality in the heart of the Hamptons. Based in a beautifully maintained historic 1860 Colonial home on an acre of lushly landscaped gardens and features charmingly appointed and individually decorated guest rooms with private bathrooms and fantastic views. First-class facilities include a handsomely decorated living room with a wood-burning fireplace where guests can relax, a sparkling full-sized saltwater swimming pool, and an elegant dining room in which a gourmet breakfast is served every morning. There is wireless Internet access around the property, which is ideally placed for exploring the best Southampton has to offer. 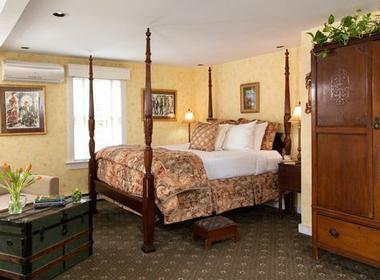 A Butler's Manor Bed and Breakfast features five beautifully appointed and tastefully decorated guest rooms with charming country-style décor and period furnishings, private en-suite bathrooms and modern conveniences. All guest rooms offer Sealy Posturepedic pillow-top beds dressed with luxury linens and plush hypoallergenic pillows, and en-suite bathrooms with walk-in showers, magnifying makeup mirrors, hairdryers, Egyptian Pima cotton towels, deluxe spa bathrobes, and Aromatherapy by Bath & Body Works toiletries. Convenient workspaces have desks and chairs for studying or working, and modern amenities include individually-controlled heating and central air conditioning, flat screen cable televisions with DVD players, alarm clocks with charging stations, irons and full-size ironing boards, and complimentary wireless Internet access. Additional guest services include homemade cookies, seasonal fresh flowers, bottled water and self-serve tea and hot chocolate in the afternoons, and beach bags with beach towels (in season). Located on the second floor of the Inn, Goose Creek features exposed original ceilings, soothing eucalyptus green walls, and large windows overlooking the garden. The room has a queen-sized sleigh bed dressed with luxury linens and plush hypoallergenic pillows and a marble en-suite bathroom with walk-in shower, magnifying makeup mirror, hairdryer, Egyptian Pima cotton towels, deluxe spa bathrobes, and Aromatherapy by Bath & Body Works toiletries. Named after a Gold Coast estate on Long Island, Oak Knoll is located on the second floor and features soaring chandelier-lit cathedral ceilings with original carved beams and south-facing windows with gorgeous views. Decorated in warm shades of burgundy, cream, and taupe, the room offers a queen-sized pewter-finished, a hand carved writing desk and a mahogany armoire. It also offers an en-suite bathroom with walk-in shower, magnifying makeup mirror, hairdryer, Egyptian Pima cotton towels, deluxe spa bathrobes, and Aromatherapy by Bath & Body Works toiletries. Boasting beach cottage-inspired décor on the second floor of the Inn, Cliffside is decorated in soft hues of sage green and taupe and features large double west-facing windows with glorious sunset views in the evenings. The room offers a queen-sized bed with a carved pine headboard, a cherry writing desk and an en-suite bathroom with shower-over-bath combination, Egyptian Pima cotton towels, deluxe spa bathrobes, and Aromatherapy by Bath & Body Works toiletries. Blending the formality of an English manor house with the charm of a countryside cottage, Eton Court boasts beautiful views of the pristine English gardens and swimming pool and features a handsome king-size bed dressed with luxury linens and plush hypoallergenic pillows, an English-style antique desk and bureau, and stocked bookshelf with plenty to read. An en-suite bathroom has a shower-over-bath combination, Egyptian Pima cotton towels, deluxe spa bathrobes, and Aromatherapy by Bath & Body Works toiletries. Named after the sunny, laid-back village in the South of France, Villefranche features south, and east-facing windows overlook the spectacular English gardens and swimming pool. The room offers a queen-sized raised four-poster bed dressed with luxury linens and plush hypoallergenic pillows and an en-suite bathroom with a shower-over-bath combination, Egyptian Pima cotton towels, deluxe spa bathrobes, and Aromatherapy by Bath & Body Works toiletries. Modern conveniences include individually controlled heating and central air conditioning, and flat screen cable televisions with DVD players. The day begins with freshly brewed gourmet coffee and an assortment of teas delivered to the guest rooms first thing in the morning, followed by complimentary gourmet breakfast with both full English and lighter options. Breakfast delights include fresh fruit, homemade bread, muffins, or scones, hot entrées such as French Toast, egg dishes, sausage, bacon and meat dishes, omelets, and frittatas. 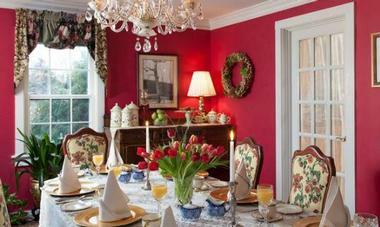 Breakfast can be enjoyed in the dining room or in the beautiful English garden in warmer weather. 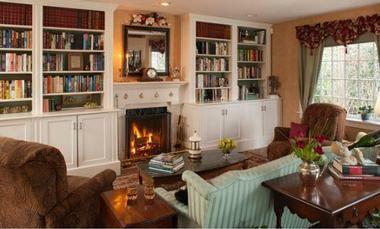 A Butler's Manor offers a wealth of amenities and guest services to create an unforgettable stay, ranging from a comfortable living room with plush armchairs, a piano and a crackling fireplace in which to relax to a delicious gourmet breakfast served in the elegant dining room every morning. 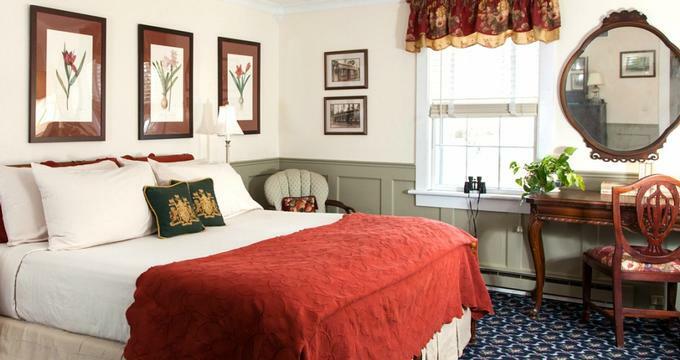 The Inn is surrounded by beautifully manicured English gardens with landscaped rose, border, and vegetable gardens and a magnificent 150-year old Sycamore Maple tree, and a full-sized saltwater swimming pool and fountain. Guest services include a complimentary shuttle bus to Southampton's Cooper's Beach along with a beach bag, beach towels and beach chairs to borrow. There is complimentary wireless Internet around the property. Located in the East End of Long Island, the village of Southampton is the oldest English settlement in New York State. Established in 1640, Southampton is one of the premier communities in The Hamptons, which is renowned for being a playground for the rich and famous during the summer. Situated just 90 minutes from New York City, the Hamptons offers an entirely different take on the State with beautiful beaches, dramatic dunes, quaint windmills, and an ethereal light that attracted renowned artists like Winslow Homer and Jackson Pollock and Winslow Homer to paint in its hamlets. 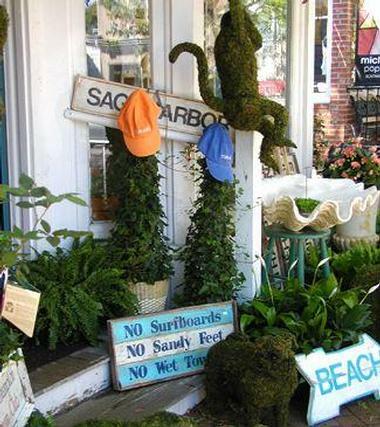 The group of towns on Long Island is famous for housing the summer residences of some of America’s most elite who escape the heat of the city to enjoy the miles of white sandy beaches, fresh ocean waters, quirky antique shops, and award-winning restaurants. Notable attractions in the Hamptons include the 17th-century Sylvester Manor Estate on Shelter Island, the Long Island Aquarium and Exhibition Center at Riverhead, and the Montauk Point Lighthouse that was built in 1700.